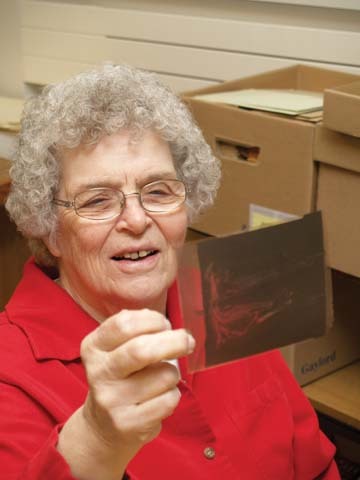 INSTITUTIONAL MEMORY - Lois Brinton sorts through the University Communications Photography Collection. University Communications has transferred more than 80 years of campus history - all captured on film - to the University Archives. Stephen Ramsay's office shelves are lined with enough books on computing and coding to terrify the mightiest technophile, but he's first and foremost a literary scholar. In the days of the High Middle Ages (1100-1350), troubadours would roam from village to village throughout Europe, spreading their message through music and word. Forget about the power of red - unless it's fall foliage. A new report on sustainability at UNL outlines 70 earth-sustaining projects and practices in the areas of transportation, facilities management, recycling and waste reduction, natural resources conservation and management, energy and utility operations, and research areas and publications. Nebraska native and NASA astronaut Clayton Anderson will be the featured public speaker for the second Space and Telecommunications Law Conference, May 1-3 at Cornhusker Marriott in Lincoln. The event will bring space and telecommunications lawyers and industry officials to UNL for the annual event. UNL will continue serving as host institution for the Association of American Universities Data Exchange through June 2012. Ivan Daley Wood was a University of Nebraska extension agricultural engineer from 1919 to 1934. Senior textile and apparel design students will present "Pulse," a runway event designed and produced by students, at 7:30 p.m. April 25 in the ballroom of the Nebraska Union. A visual and literary exhibition that pairs 20 contemporary poets with 20 contemporary paintings, "Poets on Painters," opens April 25 at the Sheldon Museum of Art. Each poet's response to a painting will be displayed alongside the artwork. The Ross is offering audiences a trip around the world in May. Students in the J.D. Edwards Honors Program in Computer Science and Management will present capstone projects April 25 during their annual Design Studio project celebration. The University of Nebraska Press will release the following books by UNL authors this spring and summer. For more information, including a full list of current and upcoming releases, go to www.nebraskapress.unl.edu. The Friends of the Center for Great Plains Studies will present the fourth annual Great Plains Invitational Art Show and Sale at the Great Plains Art Museum May 2 through 11. Visitors will be able to view the exhibitions and meet the participating artists at the free public reception on 5-8 p.m. May 2 at the museum. Putting bed pillows onto the grass to freshen, it's a pretty humble subject for a poem, but look how Kentucky poet, Frank Steele, deftly uses a sun-warmed pillow to bring back the comfort and security of childhood.